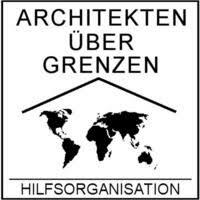 "I am impressed by the technical realization and the socio-economic purpose!" Drilling wells by hand is a very old method that has been used worldwide at shallow depths (30-40 m) for hundreds of years. Historical evidence shows that it was common to build hand-drilled wells in the Szechuan province of China 2000 years ago to access saline water, which was used to make salt. This technique was still being practiced there in the mid-20th century. People used bamboo canes that they split, scraped to create a rough surface and then put back together as tools for drilling the well and as water pipes. The method was also used in the US at the foot of the Appalachian Mountains in the 19th century where it came to be known as the Baptist drilling method. 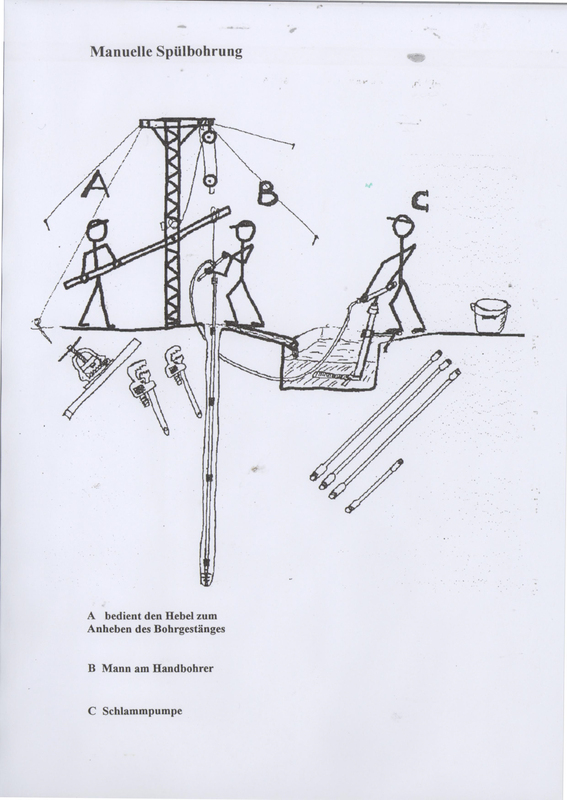 A German water technician modified the method in Bolivia. 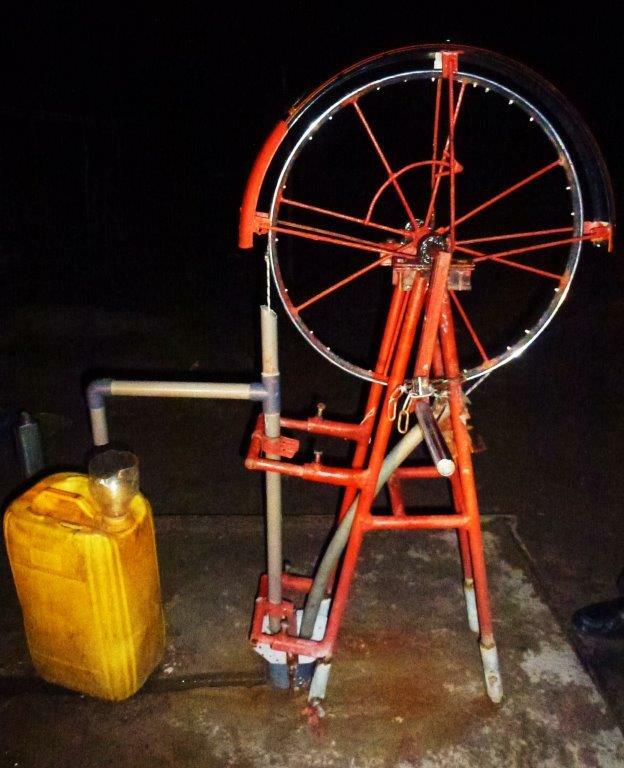 EMAS (Escuelas movil aguas y saneamento) has been successfully employing the method in villages there for twenty years. Drilling wells by hand is advantageous for a number of reasons. Forming well drilling teams provides work for at least six men, three of which work on drilling the well together at the same time. Because the work involved is highly physical, the men trade off regularly. The well-drilling equipment is mobile and is easy to set up, tear down and transport. The equipment can even be strapped onto bicycles and then the bikes pushed over dirt paths. Except for the pipes, which have to be purchased, the well technicians make everything themselves – all of their equipment, the drill pipe and the drilling rig. They use recycled metal as much as possible. 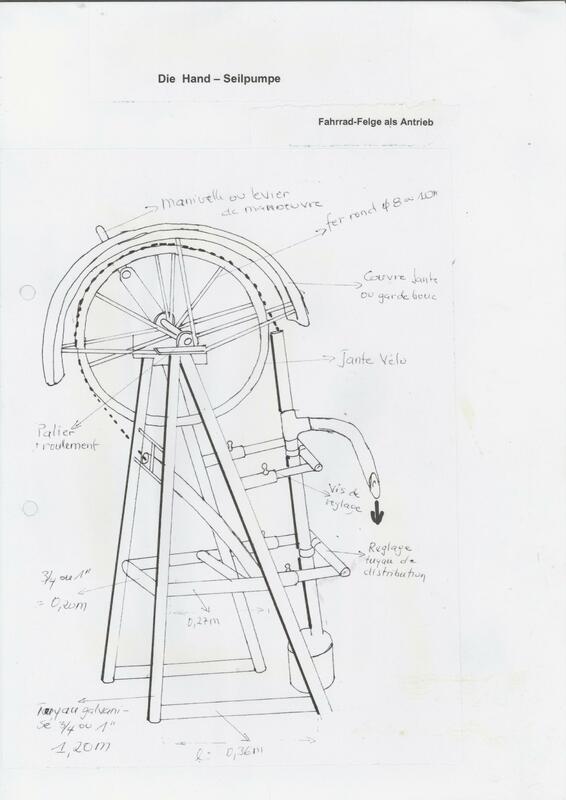 Bicycle rims are used as windlasses for the rope pump. The welding tool is the only piece of equipment that needs electricity, for which the well technicians pay a small fee at a local workshop. Craftsmanship and muscle power are all it takes to drill and operate the wells, which means people do not have to depend on generators or diesel fuel. 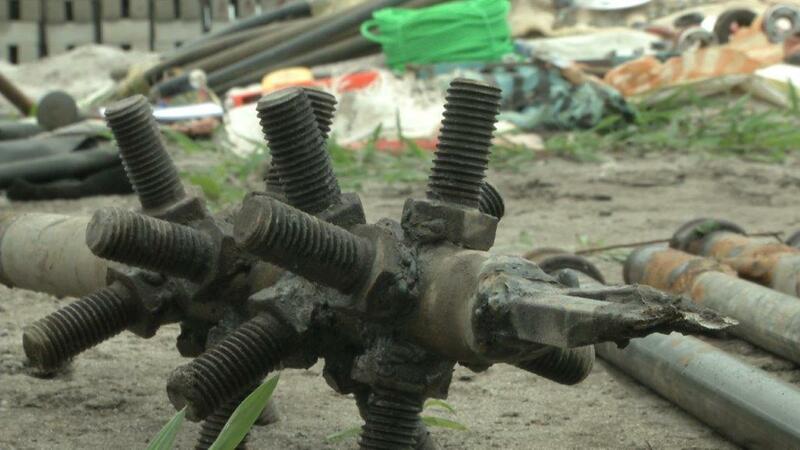 Serious accidents that can occur when building shaft wells, like people getting buried alive, are not a factor when using the hand-drilling method. The wells are usually drilled to a depth of 40-50 m, where they tap into underground waterways, or aquifers, without lowering the groundwater level. Unfortunately, the water does not rise to the surface by itself but rises only to the static pressure level, i.e., the groundwater level. For people to access the water it has to pumped up to the surface. The water that is collected from these wells is clean and clear, but it does not comply with the German DIN standard for drinking water. 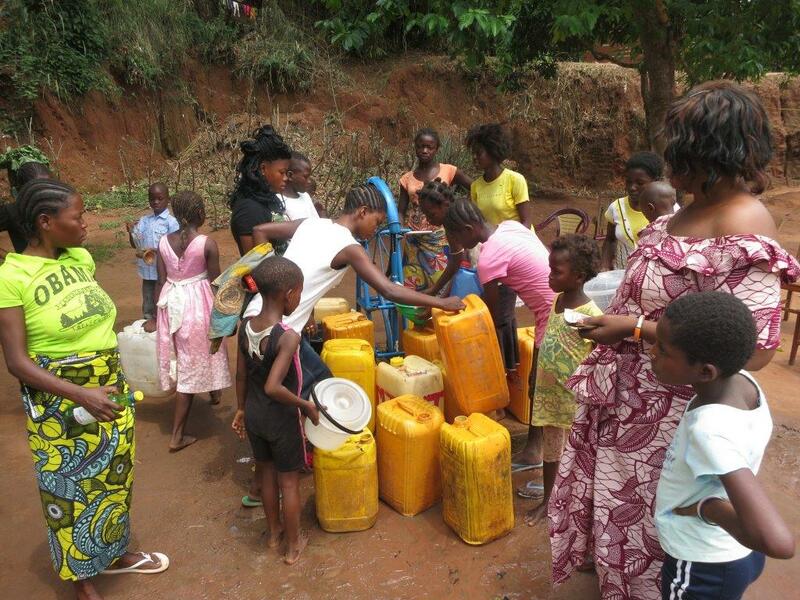 Unlike the water collected from shaft wells, this water is not contaminated by people scooping it out with buckets. Only about 15 percent of attempts end up tapping a dry well. This percentage is kept so low because the village communities commission well technicians that are very familiar with the local topography to do the work. However, it is impossible to drill a well through solid rock by hand. 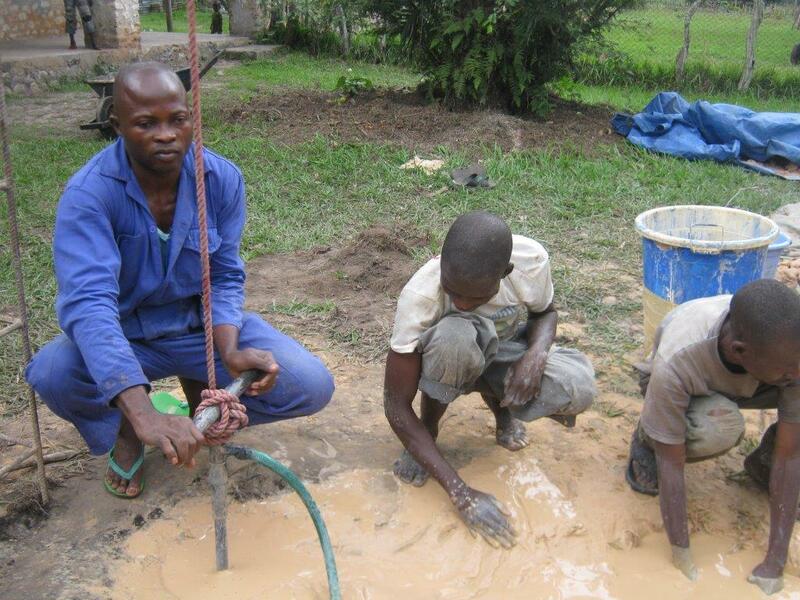 The methods used by the well drilling schools in Congo are the same ones used in mud flush drilling where technicians work with drilling sludge, a mixture of water and loam or clay. 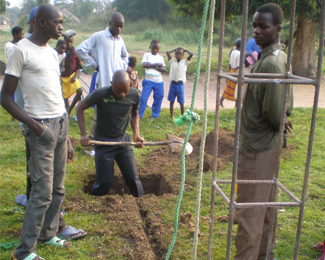 A small hole in which the drilling sludge is mixed with water is dug 3-4 meters next to where the well is to be drilled. 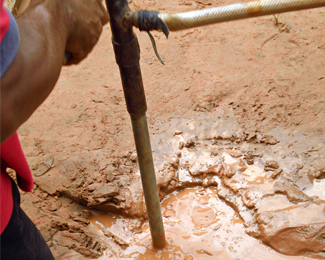 The hole is connected to the borehole via a shallow canal. The first well engineer places the drill on the ground and begins drilling moving the drill in quarter turns. 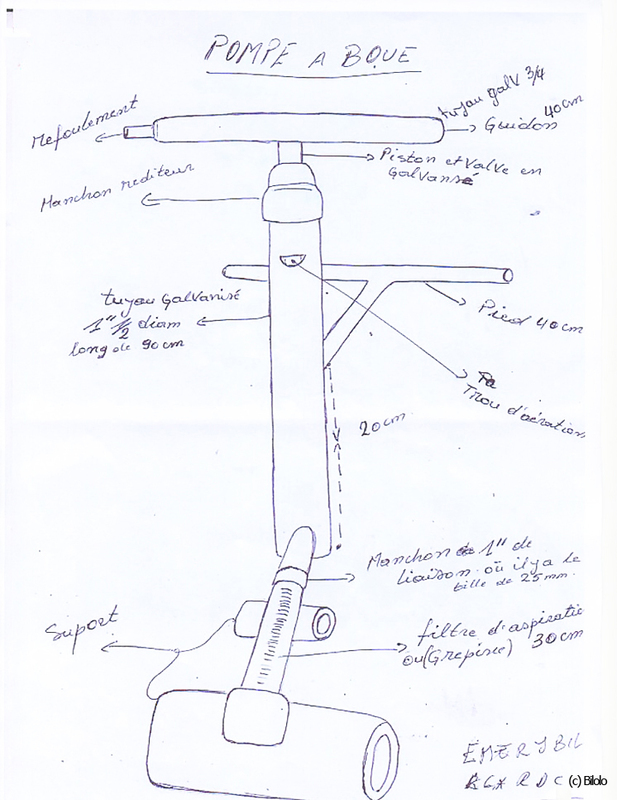 The engineer takes one step around the borehole with each quarter turn so that the hole is drilled from a 360° angle. He keeps drilling until the handle on the drill reaches the top of the soil. The drill is then removed. Soldered socket ends are used to attach the additional meter-long pipeline to the steel pipe on the drill bit. The engineers drill another meter down, after which they begin alternating 2 and 3-meter extension pipes. The third engineer on the team uses a lever that is operated via a pulley that is attached to the drilling rig to pull the entire drill pipe out about 0.5 m, after which they let it fall. That plants the drill bit into the earth (the subsoil sand or clay). The first engineer then does another quarter turn with the drill. The drill is made of a non-solid drill bit with a diameter of 90-120 mm. A one-meter-long steel pipe is used to extend the drill bit. Its handle is also made of steel pipe (Photo3). A hose connects the end of the handle to the sludge pump located in the nearby hole. A second engineer uses this to pump sludge constantly through the drill pipe to the bit. The drilling sludge comes out of the drill bit, is pressed back out through the drilled hole and is then pumped back to the hole through the canal. The drilling sludge makes the drilling process easier, transports the earth loosened by the drill to the surface and also strengthens the loose soil of the borehole’s walls (better-financed well drilling projects use betonite). The drilling sludge needs to be constantly monitored and sieved to remove small stones from the subsoil that could impede the drilling process. The color of the subsoil that is transported to the surface often varies and indicates through which layer the engineers are currently drilling. Sand, for example, has extreme color variations depending on the location. As soon as the drilling sludge becomes obviously thinner or more transparent and no more water needs to be added to the ditch, the crew knows they have hit an aquifer. Once the hole has been drilled, the crew pulls out and disassembles the entire drill pipe, which at this point may be as long as 20-40 m. Now it is time to build the actual well. The first step is to insert a piece of pipe that is about 4 meters long. Slits have been sawed into the end of the pipe, which are then covered with a filter made out of material similar to nylon stockings. 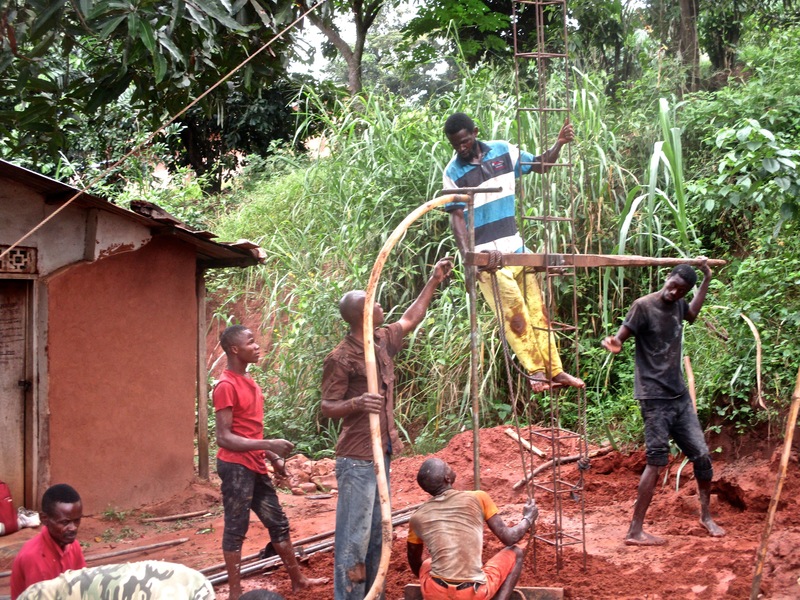 The crew than inserts 6-meter-long drill pipes made out of PVC into the borehole. These are attached and glued together. The final step is to flush and clean the borehole, which takes about a day, to secure the drill pipe above ground and to lay a concrete base into which the pump is installed. 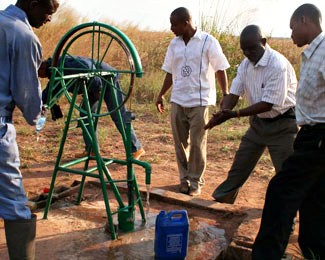 A hand-operated rope pump is often used in Congo. Depending on the location and quality of the subsoil, the entire well construction process takes between 2 – 3 weeks. 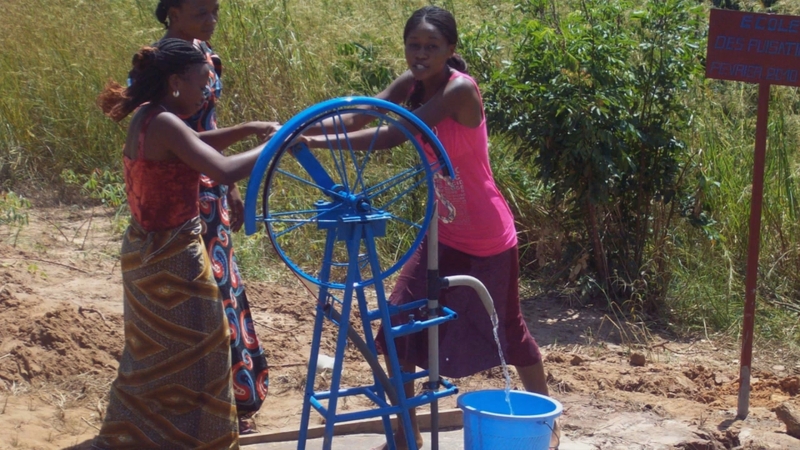 This type of well, which features a drill pipe 100 mm in diameter and two 20-mm pipes for the pump’s feed conveyor, powered by a wheel, can pump 1,000 – 2,000 liters of water a day, providing water to 200 – 300 households.